Can this multilayered plugin change the percussive game? Successfully differentiating itself from the competition, Stacker is an amazing drum design plugin that we can't get enough of. Slick GUI. Phat synth engine. Expanding on the current hot theme of the dedicated bass drum generator, Stacker is yet another 'synth-and-three-samplers' plugin instrument (VST/AU/AAX), but this time aimed at delivering percussion sounds of all kinds. Stacker lets you layer a simple synth and three sample playback modules into a one-shot kick/snare/tom/hi-hat/FX/etc sound - throw a few instances together and you've got yourself a full drum kit. The synth is an analogue model with a single oscillator that morphs from triangle through sine to square shapes, plus overdrive, adjustable 808-style attack transient (Click), an envelope-controlled noise generator, and high-and low-pass filters. It's enough to form a wide range of sample-underpinning tones, plus synthesised sounds for use on their own. The three sample modules load audio files from the factory library or, via drag and drop, the outside world, and are all functionally identical. They include all the expected basic controls - start and end point shifting, optional Key and Velocity tracking, pan and pitch control, and filtering - as well as stereo channel selection and widening, mid/side balance, a mono filter (for mono-ising everything below the cutoff), and the novel ability to offset the timing of the left and right channels. Loop points can also be placed, with the handy option to specify a number of repeats from 1-100 or infinite. All four sources have their own eight-stage Amp and Pitch envelopes for shaping volume and pitch over time, the overall lengths of which can be set between 50ms and 10s. Each has its own bank of effects, too, consisting of bit-depth and sample rate reduction, filtering and distortion, flanging, ring modulation and frequency shifting, and two bands of EQ. There's no compression, but what is there provides an interesting, creative array of sound-shaping possibilities. The auxiliary delay and convolution reverb effects (with individual sends from each source) each feature eight-stage envelope modulation (with LFO-style Loop mode) of amplitude and filter cutoff, for all sorts of rhythmic tomfoolery, and a single band of EQ. A decent library of impulse responses is included, with start and end point adjustment, and an octave of transposition up or down. We love the Scatter and Global pages. In the first, the relative start points of the four sources are offset (freely or synced to host tempo) by dragging them left and right in a graphical editor. It's a brilliant improvement on the usual per-source delay knobs that makes 'smearing' claps and snares totally intuitive, and gives this essential component of any modern drum sound the GUI prominence it deserves. The Global page, meanwhile, brings together a number of key parameters from all four sources for editing, including the filters, Amp envelope Length, tuning and stereo Width. 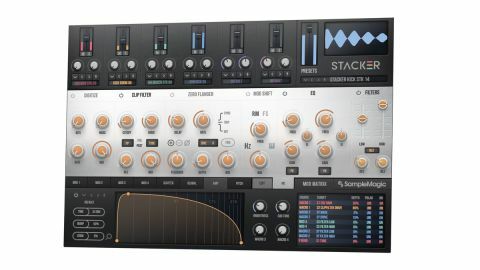 With its excellent source sample library, flexible synth engine, impressive effects and classy modulation system, Stacker sounds superb, whether producing the smallest of hi-hats or the most epic of drums; and once you get used to its homogenous channel layout and peculiar left-to-right ordering of tabs, the interface is a joy to use. We don't like the clumsy sample browsing/loading, and compression is notable by its absence, but Stacker is an inspirational take on the layered drum design concept that gets almost everything right.